Freebie Friday Over on My FB Page! Hey, everyone, my friend Larissa Reinhart has a terrific new book in a terrific new series. 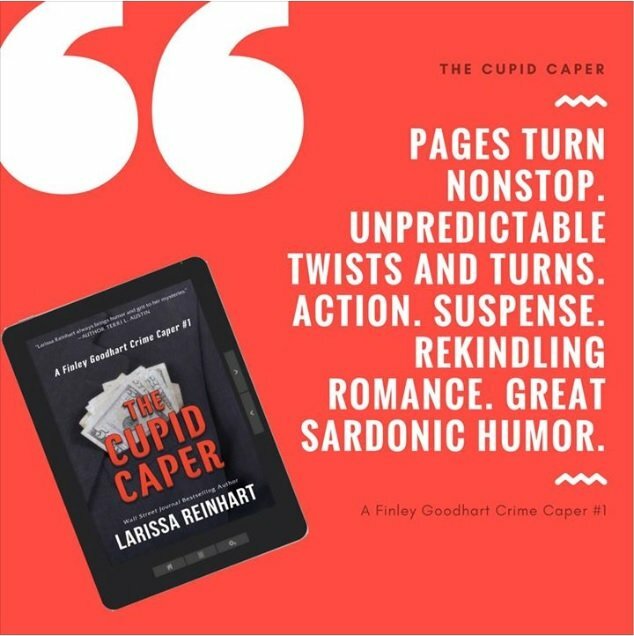 The Cupid Caper is the perfect book to escape into (which I’ve been doing this particularly trying week), and it’s perfect for a Friday Giveaway. I have 5 Kindle copies I’ll be giving to 5 lucky readers. Just head My Facebook Author Page to comment with your favorite sleuthing duos–from books, movies, or television–and you’ll be entered to win. The winners will be drawn at 10:30 EDT tonight and I’ll post the winners on my FB Page. Good luck! Next → Next post: Marked Masters — 99¢ through 5/3 in a Kindle Countdown Deal! I loved the way the good guys played the bad guys. of course I am a big fan of the old movie, The Sting, too. Fin is one of my new heroes. I’m loving Fin, too! Larissa obviously had a lot of fun with this book!